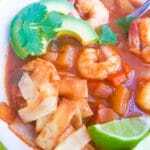 Savory Caldo de Camarón (Mexican Shrimp Soup) | Mexican Appetizers and More! 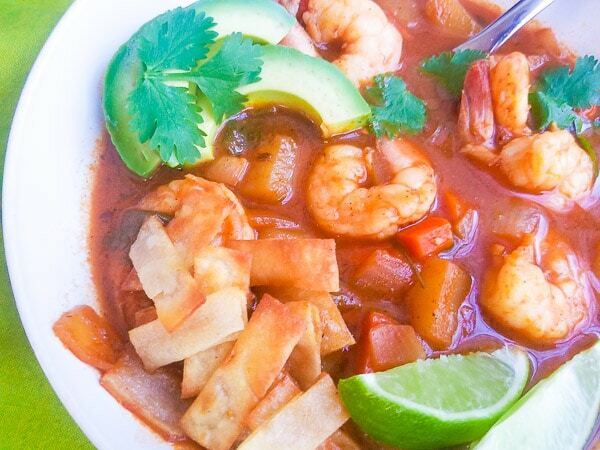 This Caldo de Camarón (Mexican Shrimp Soup) is made in a spicy (or non-spicy) fresh tomato guajillo pepper puree and flavored with succulent plump shrimp. 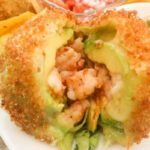 Serve with avocado slices, toasted tortilla strips and lime wedges. 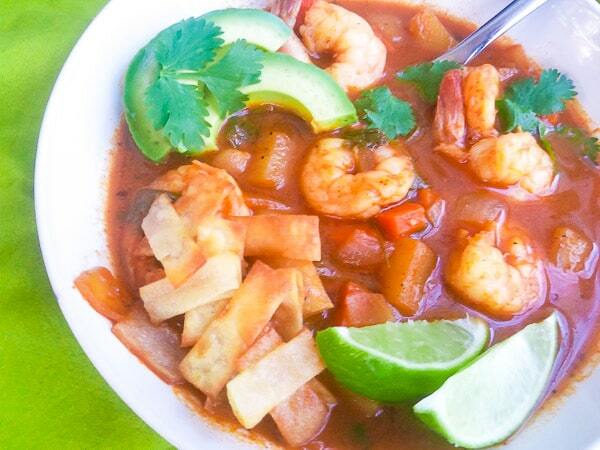 This Caldo de Camarón (Mexican Shrimp Soup) is a refreshing spicy soup that’s kind of perfect anytime of the year! Whether it’s cold or warm outside this soup will satisfy every time. 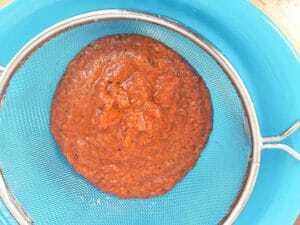 It is made in a fresh savory tomato based sauce and other simple ingredients. It’s then flavored with guajillo and serrano peppers and comes together in under an hour. 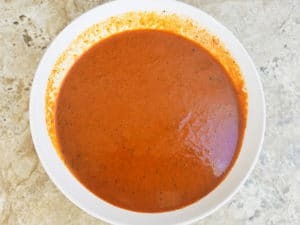 The serrano peppers make this soup a bit spicy so if you do not enjoy spicy soups but want to enjoy a delicious savory Mexican soup, just omit the peppers. If you would like a hint of spiciness, just add half of a serrano pepper. 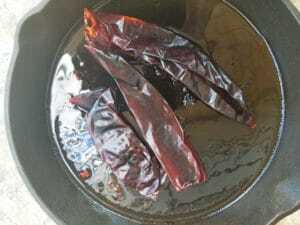 Not sure where to buy guajillo peppers? These are easily found in the international aisle of your supermarket or can be ordered online. 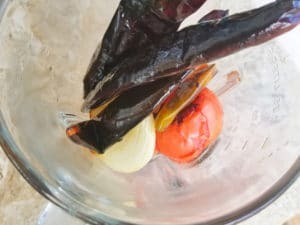 You can also choose to make this Caldo de Camarón with chipotle peppers instead of the guajillo peppers and it will still taste amazing! 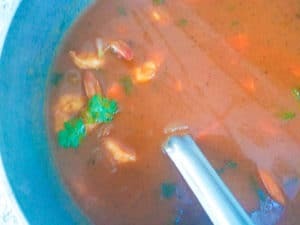 **Optional….I like to make a simple shrimp broth with the shrimp shells for a even more flavorful broth but you can also simply use water for the broth. To do this, peel the shrimps and devein shrimps. Add the shrimp shells with 5 cups of water, half an onion, 2 garlic cloves and a bay leaf to a large pot. Bring to a boil and then cook on medium heat for 10-15 minutes. Rinse the plum tomatoes and serrano pepper. In a skillet over medium heat, roast tomatoes, serrano pepper and onion for 10-15 minutes. Char on all sides. Midway through cooking, add garlic to pan to also roast. 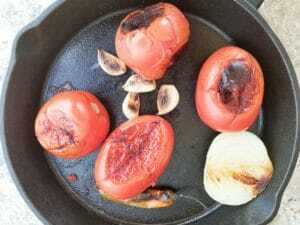 Remove the tomatoes, onion, garlic and serrano pepper from the skillet. Remove stem from serrano pepper. Add to a blender. Do not blend yet. Then add 2 tablespoons of oil to the same skillet and heat over medium heat. 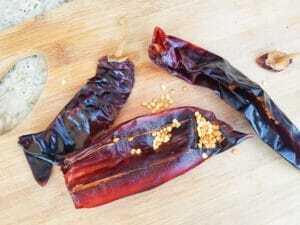 Cut guajillo peppers open and remove seeds and stems. Add to the skillet and roast peppers for a few minutes on each side. Once done, add the peppers to the blender with all the other ingredients. Blend until smooth. Strain sauce through a colander. Discard pepper skins. Sauce will now be perfectly smooth. Add three tablespoons of oil to a dutch oven or large pot over medium heat. 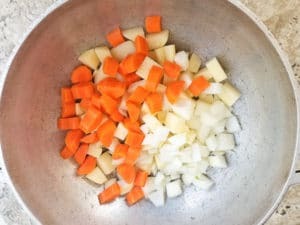 Add carrots, potatoes, onions and garlic. Stir. Cook for about 7 minutes. Add the tomato guajillo puree, cilantro and spices to the pot and stir. Lower heat and cook for 10 minutes. Add water or prepared shrimp broth. Add salt to taste. Cook for 20-25 minutes. Add shrimp the last 7-10 minutes of cooking (depending on their size) Done. 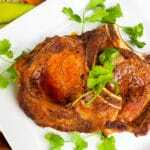 Top with chopped cilantro and lime wedges. *Optional-serve with tortilla strips, cubed avocado, warm tortillas, side of white rice. 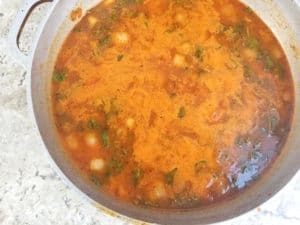 This soup will keep in the refrigerator for up to two days. 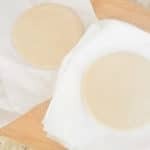 You can freeze soup for up to 2 months. For more delicious soups, you may want to check these out as well. 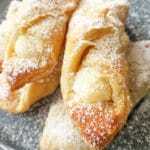 For a full list of our soups here on Mexican Appetizers and More, click soups. Add the shells with 5 cups of water, half an onion, 2 garlic cloves and a bay leaf to a large pot. Bring to a boil and then cook on medium heat for 10-15 minutes. 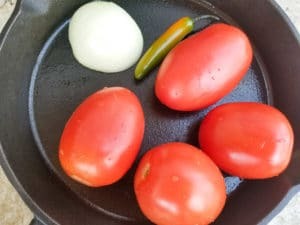 Remove the tomatoes, onion, garlic and serrano pepper from the skillet. Remove stem from serrano pepper. Add 2 tablespoons of oil to the same skillet and heat over medium heat. Add the peppers to the blender with all the other ingredients. 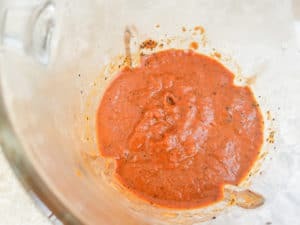 Strain sauce through a colander. Discard pepper skins. Sauce will be smooth. Add three tablespoons of oil to a dutch oven or large pot over medium heat. 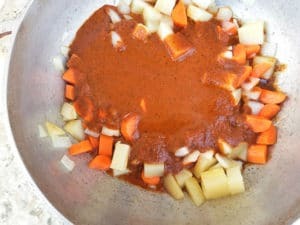 Add carrots, potatoes, onions and garlic. Stir. 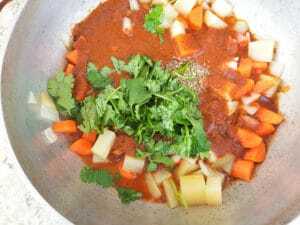 Add the tomato guajillo puree, cilantro and spices to the pot and stir. Lower heat and cook for 10 minutes. Add water or prepared shrimp broth. Cook for 20-25 minutes. Add shrimp the last 7-10 minutes of cooking (depending on their size) Done. 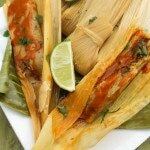 *Optional-serve with tortilla strips, cubed or sliced avocado, warm tortillas, side of white rice. Anything with shrimp has my heart! Love that this one is mixed with Mexican flavors! Will definitely try it! 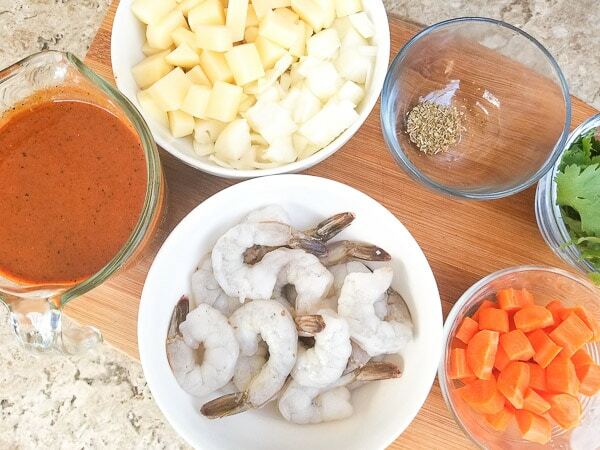 Thank you for a great shrimp-based recipe. Soup is such an amazing choice for Dinner. I love trying new soup recipes and this one looks perfect. This sounds like something my husband would love! I’ll definitely have to make him this one. I think he will love it Rosa! What a colourful and appealing soup. Those toppings and sides really make it. Great ideas. 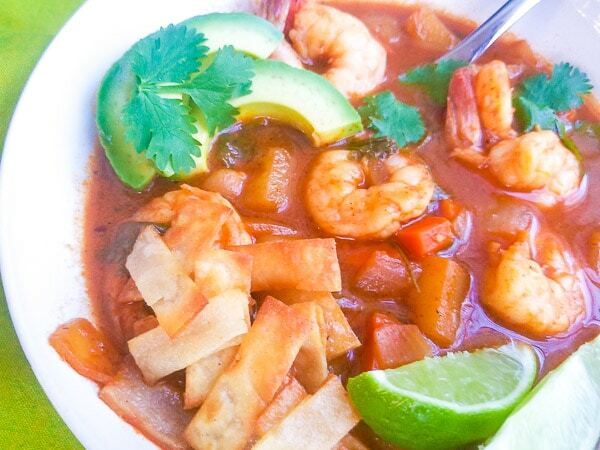 Yes Jacqueline these sides definitely make this caldo de camaron soup even more delicious!